Thanks to the hard work of Danielle Ellis, our Conference Chair, and the many members of the Planning Committee, our Fall 2015 conference was sold out. 138 participants from across the state joined us in White Plains to learn more about sustainability, customer relationships, and professional development. WICE’s President, Tabitha Robinson, announced the new WICE website and encouraged everyone who was interested to become more engaged in WICE as we are looking to grow in the areas of communications, mentorship, event planning, and social media. 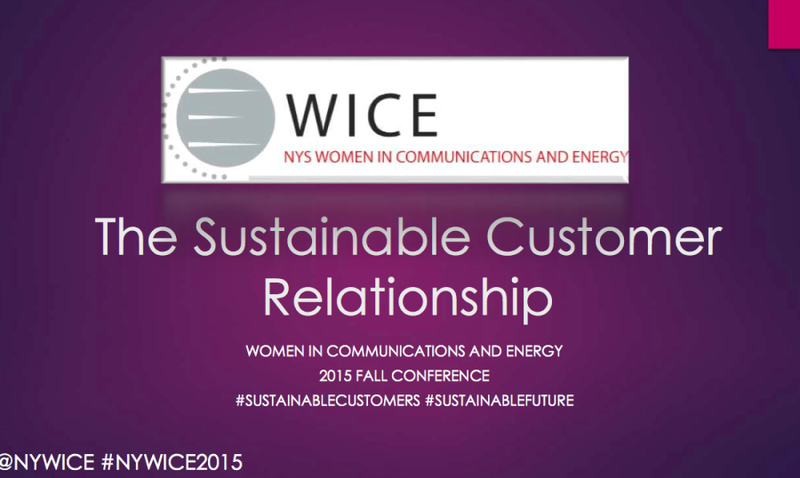 Morgan Scott presented the results of our recent membership survey, which showed that WICE was 998 members-strong. With just a few new members needed to another digit to the roster, featured speaker Anda Ray helped us surpass 1,000! Anda Ray (Electric Power Research Institute) kicked off the technical portion of the conference with her keynote, “Demystifying Sustainability and the Sustainable Customer.” She provided examples of how utilities are benefiting from integrating sustainability into their business and highlighted the opportunities that are coming in this era of transition. She also discussed sustainability from the customer perspective and the challenges of engaging energy consumers, as the average customer only has nine minutes of interaction with their utility each year. Marisa Uchin (Opower) shared many insights about customer engagement and how to increase energy savings through behavioral and personalized approaches. For example, showing energy customers what they are consuming compared to their neighbors seems to be much more effective than trying to motivate them through financial rewards, environmental concerns or good citizenship. Similarly, posting sign-up sheets in common areas has succeeded in boosting participation in energy programs, since people are able to see that their neighbors are joining. LuAnn Scherer (NYS Department of Public Service) moderated a panel on customer relationship management with utility and public authority representatives. Lori Acker (National Grid) noted that a company’s website can be its main touch point with customers and talked about the importance of making it easy for customers to access with fewer clicks for key features, such as bill payment. Emily Small (New York Power Authority) spoke of NYPA’s effort to ensure that customers had specific contacts they could call for assistance and Michael Murphy (Consolidated Edison) discussed ways to better serve the digital customer, with features like live chat. Our professional development session was led by Claire Steichen (Clear Strategy Consulting), who explained that understanding how people behave can strengthen our communication skills and confidence. She talked about the Social Style model and how to adapt our own style to work more effectively with those having different styles. We were also happy to hear from Kendall Farrell, who told us how Bottomless Closet was helping to transform the lives of many disadvantaged women who are working hard to gain new opportunities. She shared an inspiring video, which is also available on their website and YouTube. With help from so many of you, we raised over $1,000 through our raffle, which was donated to Bottomless Closet, along with the accessories that people brought. We will be in touch next year to let you know about a WICE volunteer event for Bottomless Closet and hope to see you there. Thank you to everyone who participated in the 2015 Fall Conference!